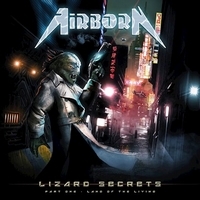 Airborn is an Italian band which is around for more then 20 years, some might remember their early albums Against The World and D-Generation which were produced by Piet Sielck. In 2014 they released their last album Dark Future Rising and now they are out to dive into a trilogy. After the intro Immortal Underdogs they storm of into Who We Are, a track which shows that they are inspired by German metal like early Helloween, Running Wild, Iron Savior and Freedom Call. The tracks of the quartet are mainly up-tempo rockers with sing-along potential. The title track Lizard Secrets sounds like a raw version of Gamma Ray... But add a dash of Labÿrinth. We Realize has a different feel, it still has twin guitar parts, up-tempo drumming, but also spoken word parts and slower passages. A tune with twists and turns. With Brace For Impact they are back on track, it's another fast one with a lot of German power metal sounds. Then they storm off into the speed metal tune Wolf Child, but the chorus isn't typical for the genre and so they create an unusual mix. At Metal Haters they seems to be partly inspired by Judas Priest, Turbo era... Again they mix different elements into the German style power metal. Slowly starts My Country Is The World, but soon they storm off into a fast riff-based tune. A bit of Freedom Call, a bit epic... And with twists and turns. Last, but not least they have a bonus track, a re-recording of Cosmic Rebels. As I don't know the original, I can't tell how much it changed. Well, the Turin-based band is presenting a decent album, even if the songs are showing their admiration for German style power metal. If you like that sound, you should give it a try!